Be sure to also check out my other Chess Cake. When a friend approached me to make a birthday cake for her husband and father-in-law, I was excited yet nervous because she said the theme was ‘Chess’. I thought ‘OK now here is a challenge for me’, to bake a cake out of my comfort zone. As soon as the word ‘Chess’ is mentioned memories came flooding back of my childhood where one day my father came home carrying a lovely varnished wooden chess board with chess pieces in a beautiful wooden box. He taught my brother and I how to play chess but needless to say I never won. What can I say, it was never my game. It’s a game of much logic, strategising as well as anticipating what your opponent will do. If you don’t anticipate a move made by your opponent then your chances of winning might not be on your side. So back to the cake. I may not win at a chess game but I managed to win at making this chess cake, well I would like to think so. I’ll let you be the judge. Well executed plan of a square cake or a round cake. Chess is played on a square chess board and I only had round cake tins. Even though I could have made a round cake I really wanted it to resemble the real thing. No square cake pan! What to do? Called on the help of my lovely friends and borrowed a 22 x 22cm square cake pan from a girlfriend. How to make the inside of the cake checkered? There needed to be two different colours layered in a specific way to give it the checkered effect. 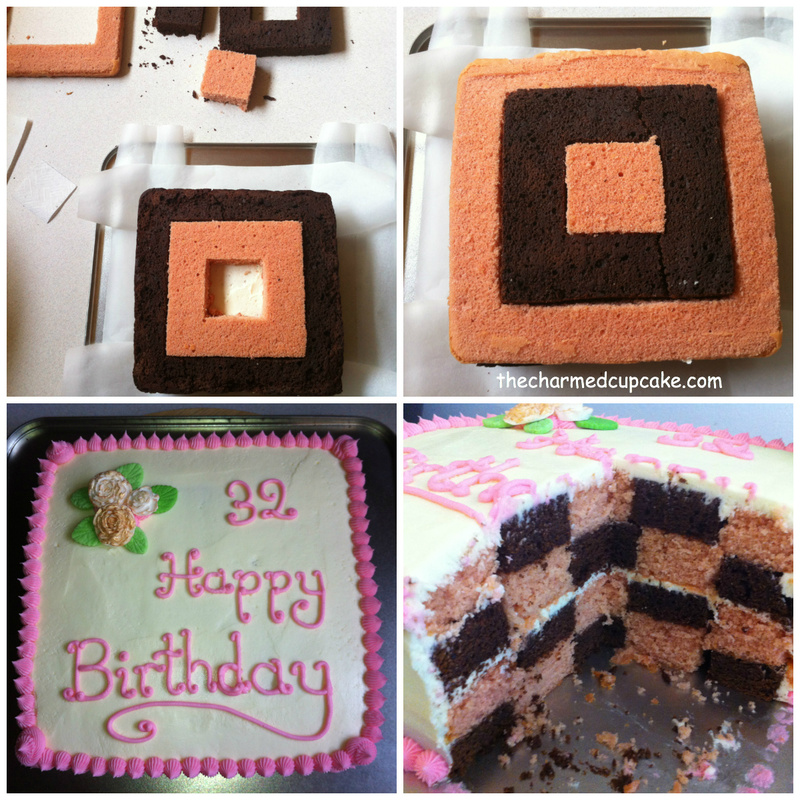 Never baked a square cake? Practice before the big day. Not the best cake but here I practiced baking and assembling the checkered cake. This is what the inside of the cake looks like when cut. Decorations? 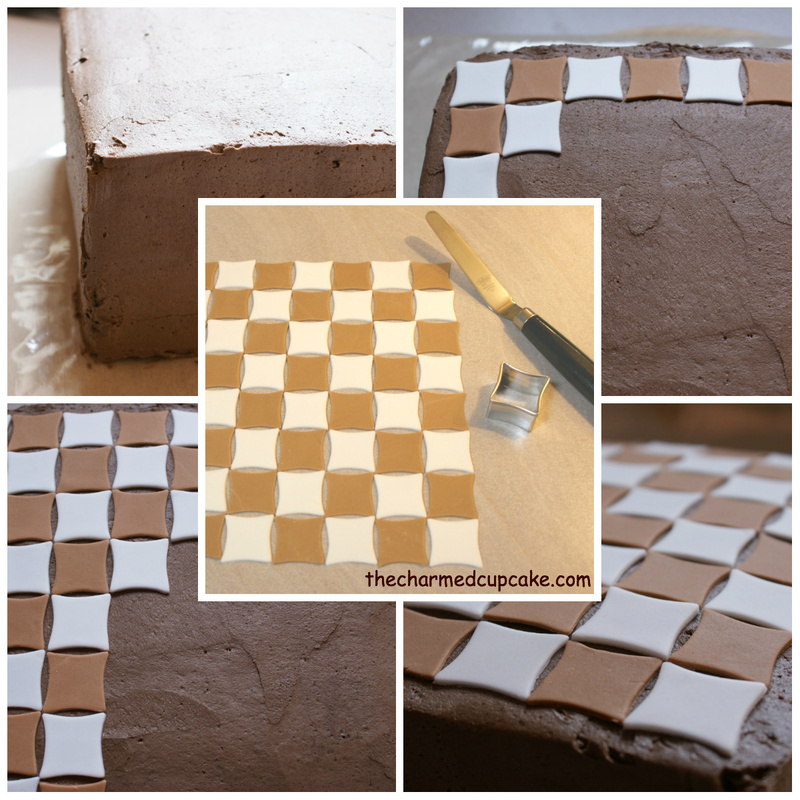 Measure out the surface area and calculate how big the squares of the cake chess board will be. If you have square or play dough cookie cutters check the sizing or cut the squares free hand. Chess pieces? 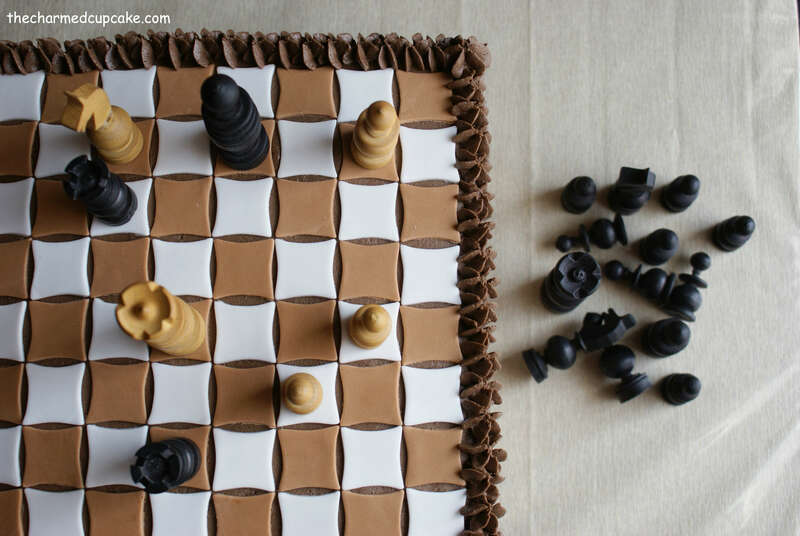 To make them from scratch, use real chess pieces or order edible chocolate pieces available on line from Euro Schach in Germany (I know the website is in Germany but send them an email in English if you have any questions). Research how the checkered pattern was created. Search for a recipe for both vanilla and chocolate that had the same texture. 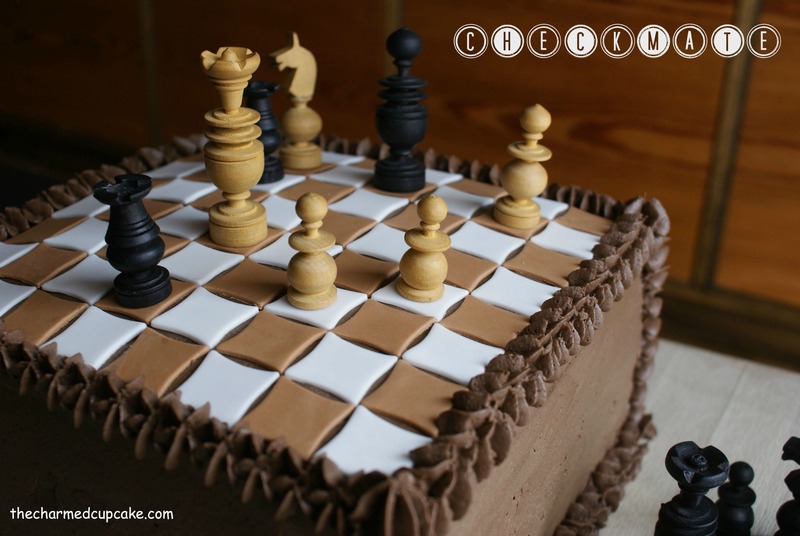 Ensure the chess pieces were the correct size for the chess cake board. So let the Chess Cake game begin! 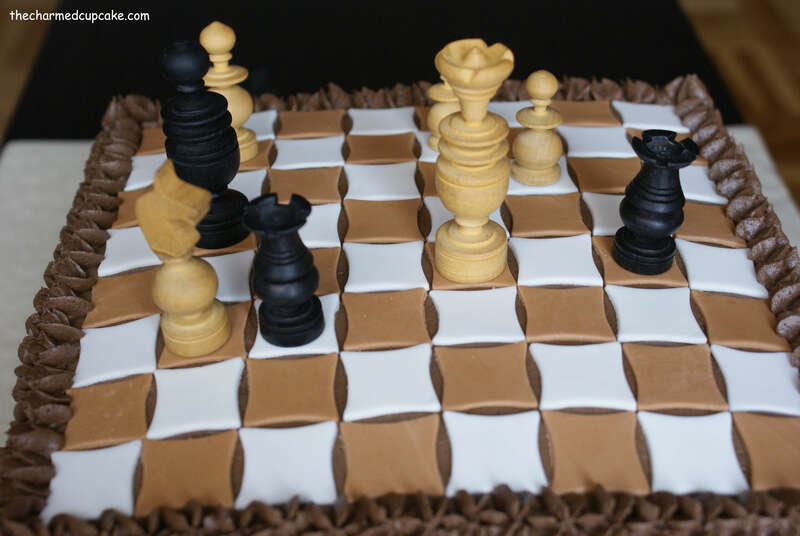 In my search for a recipe of a vanilla and chocolate sponge cake, I came across Sew White’s Secret Design Chess Cake. She has a delicious recipe, adapted from Mary Berry, as well an easy to follow video tutorial. She made a wonderful round cake but I made a square cake using the same recipe. Preheat the oven to 160°C/325°F/gas mark 3. Lightly grease two 7 inch round cake tins or two 9 inch square tins. Line the bottom with a circle of non-stick baking paper. With an electric mixer, mix the butter and sugar until light and creamy. Add the eggs in one at a time mixing well after each addition then mix in the vanilla extract. Sift in the flour and baking powder then mix in the milk. Pour into prepared cake tins and bake for 15 – 20 minutes, until the cake is well risen, springy to the touch and starting to shrink away from the sides of the tin. Allow to cool in the tin for 5 minutes, then turn out on to a wire rack, peel off the lining paper and leave to cool completely. Make the vanilla cake as above then in a small bowl, mix the cocoa powder and hot water together until smooth. Allow to cool slightly, then add to the vanilla cake mixture, mixing well until evenly blended. Spoon the chocolate mixture evenly into the two pans. Bake for 15-20 minutes, until the cake is well risen, springy to the touch and starting to shrink away from the sides of the tin. Allow to cool in the tin for a few minutes, then turn out on to a wire rack, peel off the lining paper and leave to cool completely. Beat in the sifted powdered sugar, cocoa powder and milk. Use immediately or refrigerate till ready to use but beat once more before piping. I wanted a high cake hence the 4 layers but of course you can just do two layers if you wish. I then measured out two squares on a piece of paper – 1 large and 1 small. 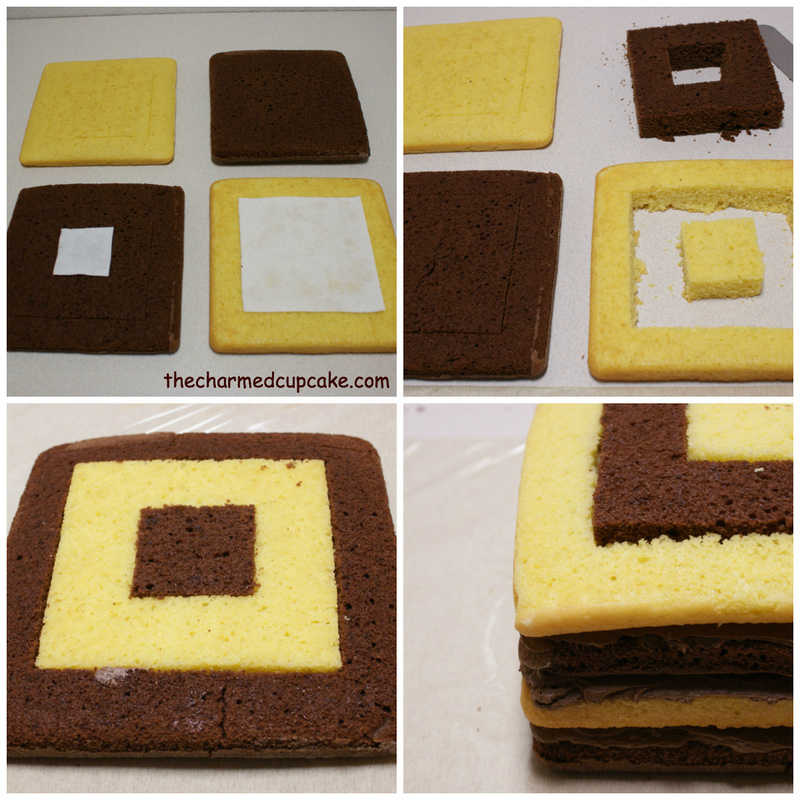 Cut the large square on all the cakes followed by the small square. You will have 12 pieces in total – 3 pieces per cake. Spread some buttercream on the cake board. Use a knife or large pallet knife to help lift the pieces out, begin with 1 large cake piece (the outer ring) of your choice then interchange the pieces. The sponge cake is lovely and soft so be careful when trying to lift the pieces out, it also doesn’t matter if pieces break off as a little buttercream can fix it. I spread a layer of buttercream between each layer but it is entirely up to you if you wish to spread the layers with jam, spread only the middle layer or no filling at all. Once all the layers are assembled, give the cake a crumb coat with a thin layer of buttercream. This helps all the crumbs stick so that you do not get any crumbs in the final coating. Refrigerate the cake for 10 – 15 mins to allow the crumb coat to harden slightly then spread with the final coating of buttercream. Don’t worry too much if the edges are not perfect as they will be covered with a piped buttercream boarder. The night before I had cut the squares for the chess board out of fondant so that they would be dry and hard. I had a small diamond shaped cookie cutter that was just the perfect size. To give the cake its finishing touch I piped a simple star tip boarder all around. 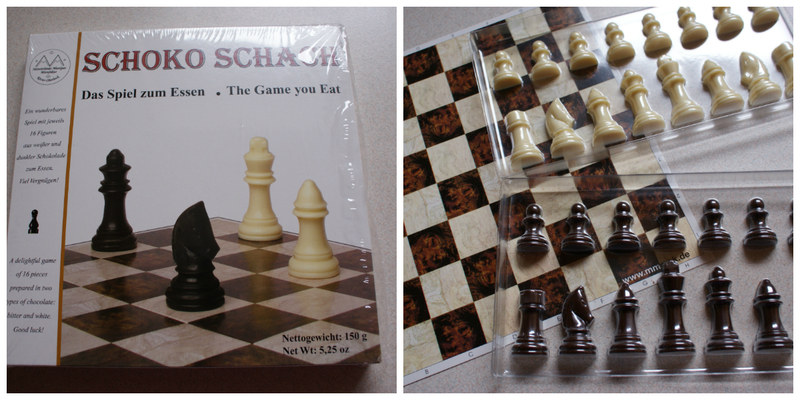 Here I used real chess pieces just for the photos as the edible chocolate pieces were quite delicate. They stayed in the box till they were transported to its final destination. I guess chess can be fun when you can literally eat the pieces and enjoy a slice of cake as your winning victory ‘Checkmate! I eat your king’. You might also like to check out my Father’s Day post where I also made a checked cake but in a round form. I’ve made round checkered cakes, but not square. I tried your pattern, but my pans we’re oblong. The result wasn’t checkered, but looked ok. I’ll use square pans next time. One tip, freeze the cakes before trying to assemble them. I used gnache to “glue” the pieces in place. Sorry I don’t have a picture. The cake was eaten before I got a chance to take one. Can you do this using a rectangle cake tin? Oh i couldn’t eat that, it’s way too much work…looks awesome. 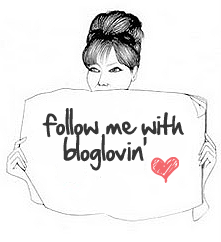 Awww thanks sooo much sweetie, that is really lovely of you to think of me. oh wow! This looks absolutely amazing! you are a very talented baker, i hope i can progress to be as good as you, i’ve just started and mine are nothing compared to yours! Thank you for the lovely comment 🙂 you will definitely progress if you keep baking. Practice makes perfect and I am still learning all the time. What a labour of love!